Pictures from "Treasure in the Shawnee Hills"
Pictures from "Shawnee: The Adventure Continues"
Pictures from "A Cherokee Wish"
C. C. Wills lives in the country just south of Danville at the edge of Westville on 23 acres he and his wife bought for their retirement home. Having retired from Kraft Foods after 35 years he decided it was time for something else in his life. Both C. C. and his wife like spending time with nature – not only do they have 12 acres of timber, they have also planted 300 Black Walnuts, 20 Pecans, and various other nut trees, with plans for more. Also, they put in 250 eastern Red Cedars for the deer and turkey. Having grown up in a family that hunted and fished not only for fun, but also to survive, his parents taught him values, work ethic, and the respect of others. He feels very blessed to have both of them. Having grown up in Champaign until he was 48, he and his family moved to Danville in 2002 and he is very busy enjoying his retirement! Wills started out as a self-published author through FriesenPress. 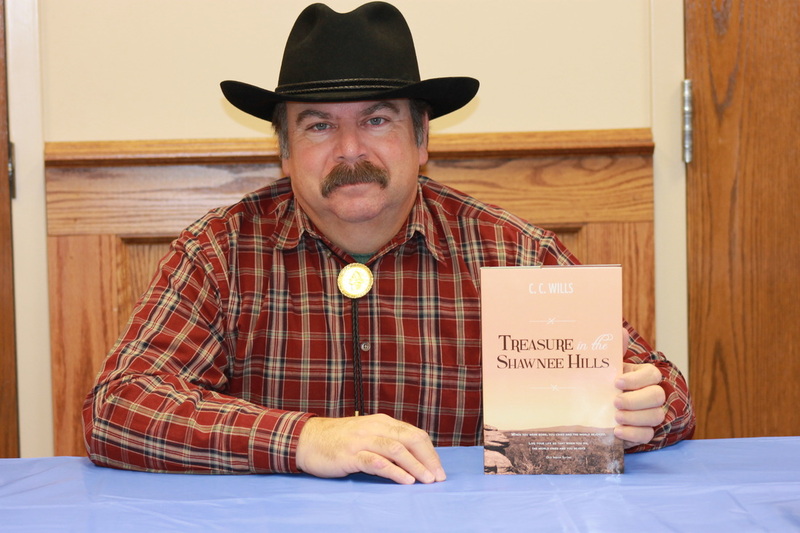 "Treasure in the Shawnee Hills" was his first attempt at writing and was followed by two sequels. 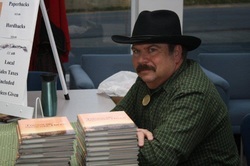 His second book is "Shawnee: The Adventure Continues" followed by the third book of the trilogy "A Cherokee Wish". He also has several other storylines in the works with hopes of becoming the author he believes his Grandmother would have liked to be. It is actually through her linage that part of this story was conceived - her line comes from a full blooded Cherokee Grandmother several generations back. It was both his passion for coin collecting and his love of being in the woods that sparked the idea for this first story. He started collecting coins around 1992 although his interest in them came much earlier while he worked at the Dairy Queen in the sixties. He remembers finding buffalo nickles, mercury dimes, and an occasional Franklin or Kennedy half dollar...these coins are what created a desire to learn more about the coins and their history. Later he started collecting currency and it was a particular note from the Shawneetown Bank that helped him to choose this bank for his story. As a young teen his father included him on deer hunting trips taken in the fall each year....location, the Shawnee National Forest. It was on these trips his love for the woods really grew. He was already used to being in that type of environment from their weekend trips every week to the local Sangamon River to fish. His father taught him alot about hunting and fishing during those early years. Later after Wills got married, he and his wife and their church friends took spring camping trips again down in the Shawnee National Forest. It was on these hunting and camping trips that Wills came to know the area where his story took place. That area can be very enchanting and definitely will grab you! C.C. Wills is the author of “Treasure in the Shawnee Hills” - first in this series of adventure packed mysteries. Wills says, “Writing these type of fiction stories gives me a chance to be someone else, a part of me and yet someone completely different at the same time…it is fun to dream. You never know where the idea for a new story will pop into your head, or even additions to your on going manuscripts. I have been asleep over night and had bits of my stories enter into my dreams. Likewise, laying in a hot bath relaxing when suddenly a thought will run through your head and you hope you can get it down on paper before its forgotten. I have even been out on my mower and had to stop to put a thought down before being lost. They can leave sometimes as fast as the come. I sometimes wish I had spent more time asking my grandparents about growing up. My Grandma Wright, my mother's mom grew up in the hills of Kentucky and I can assure you there where stories to be had from that time. My mother even shared some stories with me of visits she had with relatives down there. Some of the things she shared I will definitely work into a story somewhere down the road. In "Shawnee: The Adventure Continues" I was hoping to continue with the thought of treasure hunting introduced in my first book. Dean, my main character is pursued by someone hoping to get his hands on the rewards Dean was blessed with from his treasure hunt. I was attempting to continue with Dean's story and yet drop back and bring in some history. Once again I introduce more of his ancestry and at the same time add in some of our country's history. "A Cherokee Wish" is the final chapter in Dean's treasure hunting. In this book Dean is once again looking for family gold mentioned in 2nd book. He is convenced that his Uncle William was correct in his speculation of the gold's existance. Headed back down south Dean is determined to find the gold and yet something else seems to be pulling him down to the area besides the gold. Wills has added a couple more elements into this story line combined with killings, mystery and a few surprizes. This book completes Wills' saga of Dean and the Treasure Trilogy. "Memories" is my fourth book and would be considered a biography / autobiography. It is the first book published by my own publishing company - Grape Creek Publishing! This books contains a variety of family stories from growing up in the depression to present day unsual and one even a bit spiritual. The last chapter is about my uncle's family and a connection they had with Al Capone and Bugs Moran. Check it out. My 5th book "A Collection of Short Stories by C.C. Wills" is a collection of 8 short stories in different genre. It was my way to experiment with different forms of fiction without commiting to a full story for each. I think they are fun little stories and fast reads. There is one Gruesome Horror called "Bite of the Grizzly", a Ghostly Horror called "The Haunted", Science Fiction story know as "Through the Eye and Beyond", A Murder Mystery called "Murder in Pounds Hollow", a Christian based fiction called "24 Hours Till Grace" and 3 in the Adventure or General Fiction area which are "Shawnee Wildcat Gold", "Mama's Fried Chicken" and "The Lottery Ticket". In my book version I have added as an extra the first Chapter of my second book "Shawnee: The Adventure Contiues" which I kind of felt was a bit of a short story in of itself. My 6th book "Solitude...Portraits of the Lonely" is my first full length murder mystery. It is a fictional story based on a true case of SENIOR ABUSE in my family. The circumstances of the unfortunate abuse are heart breaking and actually happened against my father. I decided to add to the story a fictional murder to make it a more entertaining read for the average reader but my intent was to let others know of the heartaches that come from this cruelty. I hope you can enjoy the story and yet hope you realize the effects this abuse can have on a family. Please keep your eyes open to signs within your own family or families of friends. The 7th book to be added to my credits is called "Grandpa Tell Us A Story and other Short Stories." It has 14 short stories in all - 8 from the series of shorts known as "Grandpa Tell Us a Story" and the other 6 are individual shorts. The titles of these 6 are: "On The Ridge", "A New Beginning", "The Homestead", "Hunting A Spooked Tom", "A Walk In The Snow" & "His First Love". The first 3 of these 6 and "A Walk In The Snow" are all excerpts out of my first 3 books that make up The Treasure Trilogy and were published as individual shorts for the reading pleasure of those who have not read the trilogy. Hope you enjoy the new Short Stories! If you go to my page of New Projects you will see I am working on a new western based book known as The McAllister Saga. This will be my first attempt at writing a western but I think it will be fun! I am adding new short stories periodically so check my Short Story page for new ones as I will not list them all here. All of my books including each of the individual short stories can be found in eBook version on Smashwords. There are many different eBook versions available so please check them out. The Nook version of each can also be found on the Barnes and Noble website! This picture is C.C. Wills after 6 years as a writer (March 2017). I don't know what the future has in store but I would love to keep writing as long as the stories keep coming and readers keep buying. Right now I have 7 full sized novellas - none are quite big enough to be considered a novel. However this 8th book I intend to be novel size. It is my only western titled "The McAllister Saga" - a four part book all in one. I also have written 22 short stories so far with more on the way. They all can be checked out on Smashwords - the eBook versions of all of my books.